Backache is quite a common and troublesome problem nowadays. The modern sedentary lifestyle is one of the most important yet ignored factors encouraging this ailment. The pain generally occurs along the spine, in the center of the back, or on either or both the sides of the spine. More often than not, a typical Backache affects the lower back of an individual causing mild or severe pain. Usually, a poor posture or prolonged sitting, stooping or standing in one position causes this problem. Though, there are serious factors too. It is a degenerative disorder that causes further problems like difficulty in bending. The risk of developing this ailment increases when the muscles in the back and stomach become weak. This muscular pain can be acute or chronic. Acute Backache is a sudden and severe pain in the back whereas Chronic Backache is characterized by a steady pain in the back lasting for a period of three months or more. The treatment usually involves the use of conventional medicines. But, nowadays alternate cures and therapies like acupuncture, acupressure, yoga and a number of natural home remedies for Backache have also gained popularity because of their effectiveness. Acute Backache is mostly caused by back traumas, injuries, fatigue or mechanical stress. Activities requiring an individual to remain in the same posture for long periods of time result in back strain and increase the risk of developing this ailment. Plus, sudden jerks or jolts resulting in the tearing of back muscles also result in the same. Emotional stress has been found to bring about muscular spasms. Other factors include muscular tension, lack of adequate exercise, improper nutrition, incorrect posture and other lifestyle factors. Females often tend to have Backaches during pregnancy. Plus, wearing high heels puts strain on the back thereby resulting in Backache. Factors like Slipped Disk, Spondylosis, Osteoporosis, Spinal Curvature, nerve inflammation and other related conditions. At times, acute and chronic diseases like kidney diseases, Cystitis, Gallstones, Prostate problems, Female Pelvic Disorders, chronic infections, fevers, chills etc have also be held responsible for causing Backache directly or indirectly. The most obvious symptom of Backache is muscular pain, stiffness, and swelling in the back. The pain may radiate to the legs or other limbs and lead to numbness and stiffness there. 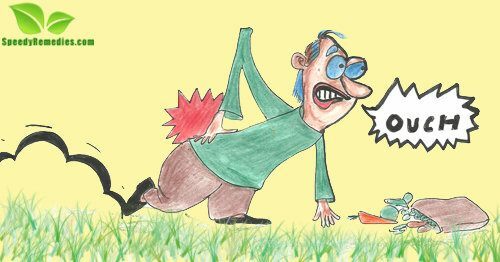 At times, the pain is accompanied by a tingling sensation in the back, buttocks, back of the thighs or legs. Severe pain may restrict the affected individual’s movements like bending forward, backward or sideward. • Application of hot and cold compresses is one of the most popular home remedies for Backache, especially for Backaches caused by sudden jerks. • Take 60 ml of coconut oil, mustard oil, or sesame oil and fry 10 cloves of garlic in it until the cloves become brown. Then, cool this mixture and apply it on the back. Finally, have a warm water bath after three hours. Follow this natural remedy for at least 15 days to get rid of Backache in a natural way. • A poultice prepared from raw potato is regarded as one of the most successful natural home remedies for Backache treatment. To prepare the poultice, spread a thin cotton cloth on raw potato and cover it again with another cotton cloth. • Another effective home treatment for Backache is to apply a poultice prepared from cabbage leaves. For this, boil some cabbage leaves in some milk until a jelly-like mixture is formed and then spread it on a cloth. Leave this hot poultice on the back during the night. • Having a piece of chebulic myroblan herb after meals acts as an effective natural cure for Backache. • A paste-like mixture of 30 grams of cascus grass, 30 grams of coriander and 60 grams of wheat (soaked in water overnight) is useful in dealing with Backache. Boil this mixture in approximately 250 ml of milk till the milk reduces to two-third of the original amount. Finally, drink it to alleviate the pain. • Taking a combination of lemon juice and salt two times on a daily basis is useful in relieving Back aches. • Drink some warm milk mixed with two or three pieces of cardamom and a pinch of turmeric. Take this mixture at night before bedtime to reduce the pain by morning. This is of the simplest and equally effective home remedies for Back aches. • A tea prepared from five cloves, five black pepper corns, and one gram dry ginger powder should be taken two times per day to ease back pains and problems. • Make a bundle of some bishop weeds placed on a small cloth. Heat this bundle over a heated container and then place it on the back. This remdy is highly beneficial in the natural treatment of Backache by relieving the pain. • Lightly massaging the back with mint oil or turpentine oil is considered as one of the most effective natural home remedies for Backache. A mixture of lemon grass and coconut oil can also be used for massage. • Regular consumption of basil decoction prepared from 10 basil leaves in a cup of boiling water (till it reduces to half) helps in healing such aches and pains. In the mixture, add a quarter teaspoon of salt as well. A diet rich in proteins and vitamin C is a highly recommended natural home remedy for Backache patients. Minerals like calcium and phosphorus are good for overall bone health. Vegetables like carrot, cabbage, cucumber, radish, onion and lettuce are highly beneficial when taken in raw form. Sprouts and salads are a healthy way to include fresh fruits and vegetables in the diet. Citrus foods like tomatoes, strawberries, blueberries etc are also helpful in this regard. Plus, regular consumption of steamed vegetables also helps in reducing Back aches. Moreover, having 2-3 cloves of garlic daily in the morning, serves as one of the most valuable home remedies for Backache problems. Backaches are sometimes caused due to obesity or constipation. Hence, the diet should focus on eliminating these problems to eliminate Backache too. Besides, stay away from cigarette smoking and alcoholism as they tend to worsen the situation. Strong caffeinated beverages are also best avoided. Refined and fatty foods with excess salt or sugar should be avoided as far as possible. Needless to add, maintain a proper posture while sitting, standing or sleeping to avoid Backache.